These en-suite luxury superior rooms have all of the modern conveniences. Betty’s Room: Front facing in the main manor. Double bed with roof terrace, in-room fireplace and en-suite original art decor bathroom with bath and shower. Space for a 3rd bed/cot for a child on request only. Daisy’s Room: Overlooking the back gardens from the main manor. Two large single beds, roof terrace. En-suite with shower. Jock’s Room: Front facing in the main manor. Twin queen size beds and in-room fireplace. En-suite with shower and bath. Space for 3rd bed/cot for a child on request only. This unique property is set in 12 acres of private land within 140 acres of an indigenous forest. It is only 20 kilometres from Nairobi city centre. Built in the 1930s and modelled on a Scottish hunting lodge, this luxury boutique hotel has maintained all the charm of the era and is now famous for its resident herd of Rothschild Giraffe. The Manor offers you an unparalleled experience of the giraffes, with them vying for your attention at the breakfast table, the front door and even your bedroom window. The Manor offers a pleasing mixture of traditional and modern elegance. With its two storey entrance hall, majestic staircase and immaculately furnished interiors, the Manor offers guests the unique chance to interact with the rare Rothschild Giraffe. The area is home to many animals including warthogs, bushbuck, dik dik and more than 180 species of birds and has a striking view of the Ngong Hills. Inspired by the Manor's original 1930s decor, the property has designed 10 luxury double ensuite bedrooms with large four poster beds, antique furnishing, striking art decor and spacious bathrooms. 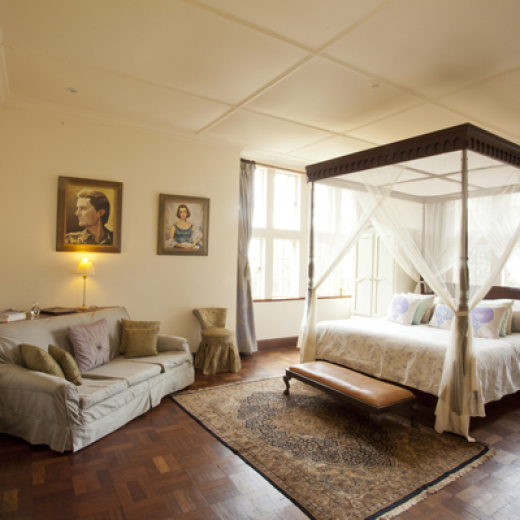 The Finch Hatton and Karen Blixen suites are suitable for families and have direct access to the courtyard. The sitting room has large picturesque windows through which you can appreciate views of the giraffes and the surrounding sanctuary. The large veranda and terraces give you the opportunity to hand feed the friendly giraffes, as well as enjoy amazing views of the Ngong Hills. We offer breakfast, lunch and dinner. Breakfast is served in the sunroom, with its enormous windows flung open – to welcome the giraffe that may come and join you. Dinner is a cosy affair as the drawing room fire is lit and guests and managers gather for evening drinks. You can either choose to have a candle lit meal in the dramatic wood panelled dining room or at your own table under the stars surrounded by the glow created by lanterns and candles on the terrace. Children are ages 3 to 11 years inclusive. 12 years and over is an adult. 2 years and under is an infant. Infants stay FOC. There is only a child sharing rate in the Standard and Superior Rooms at Giraffe Manor – this rate is the same whether they share the room in one of the beds or whether they are in an extra bed. Extra beds do not always fit, please see details on the description before booking. If a child is to be allocated to a single room, the rate charged is the FULL single room rate.